Kristin: With UK-based forecasting consultancy The Future Laboratory in town, local magazine CityMag weeks away from releasing a special futures supplement, and futurists featured during Entrepreneurship Week, you might find yourself wondering what’s with all this future? Everyone thinks about the future, but thinking constructively is difficult. In a recent public community forum for Adelaide City Council’s Picture Adelaide 2040 initiative, participants cited a “change in mindset” as one of the critical things important for Adelaide’s future. 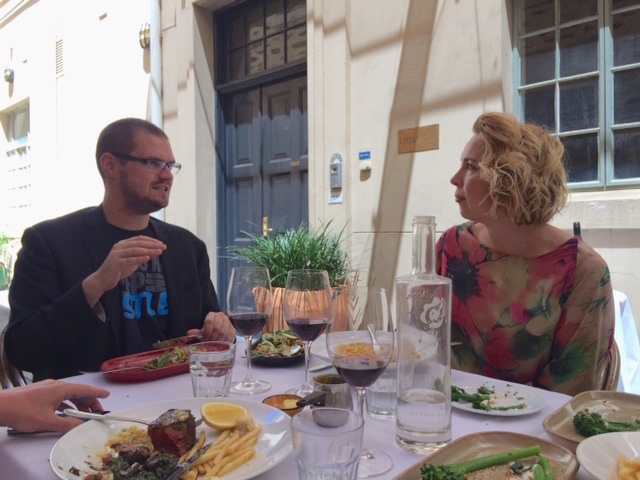 Changing mindsets was the main topic of conversation at a lunch I recently hosted for Adelaide’s futurists. Futures as an academic discipline and profession started around the time of Cold War strategist Herman Kahn in 1960, though ideas about the future stretch to HG Wells and beyond. Yet the current pace of change and demand for strategic advantage have made futures careers more visible. Despite the term “futurist” coming loaded with biases and misconceptions, there is a coherent way of working. A futurist uses methods and practices to help people escape from the limitations of their own experiences to imagine something new. And then, most importantly, provides ways in which social change can be created in the present moment, and in spite of resistance. It’s a broad remit, which is why the backgrounds of the futurists at lunch were incredibly varied – engineering, human resources, nursing, accounting, communications, politics, military intelligence, anthropology, town planning and urban design and policy development. Our methods ranged from data mining to qualitative analysis to the use of myth and metaphor, but we found we shared some personality tics – a delight in pattern recognition, the tendency to naturally push discipline boundaries, being the trouble-maker by challenging the status quo, and a desire to work with people to make things better. Building a desirable city by studying the interaction of people, technology and urban spaces. This led to a discussion on how Adelaide could build on its values while experimenting with new ideas while ensuring social inclusion and quality of life. Anticipating technological disruption and the exponential change we face due to automation, robotics and computational power. We talked about the impacts and building businesses where creative and compassionate humans can excel. Driving environmental sustainability through policy development and practice change. The natural system in which we live and work is critical for our survival. Any argument about climate change is not a scientific one, but a political one, and political capital that short changes a sustainable future will be short-lived. Valuing wisdom. There are currently more than 20 people in Adelaide undertaking an online course through MIT on using the theory of “presencing” for creating social change. Being more attuned to intuition and deeper purpose allows for new ways of being, and new ways of responding to challenges. Once you’re aware of futures, you’ll see it everywhere – we’re wired for that. Ideas and trends can’t predict the future, but studying the future creates awareness of change and an openness to new ideas. We have this capability in Adelaide. Working with futurists enables you to stop asking asking “how did I get here?”, and start making change in the present. Kristin Alford is a futurist and the founding director of Bridge8. With her at the futurists’ lunch were creativity and cities consultant Margie Caust, author Kristina Dryža, accounting entrepreneur Chris Hooper, former Lord Mayor Stephen Yarwood, big data analyst Parinaz Sariri, and Mark Robinson and Vanessa North from the Australian Tax Office.